There is a disturbing pattern in the Anglo Saxon press when the subject is ecology, and in particular when they talk about Brazil’s role in it. Some present the country as a potential savior of the planet but most articles portray it as an irresponsible menace and seek to open the eyes of the world eyes to the “natural disaster” sponsored by its reckless governments. There is no doubt that there are reasons to be alarmed; the Brazilian Amazonian forest has taken a great beating due to the irresponsibility of powerful lobbies who put their interests above the planet’s health. They are indeed active, aggressive and have a big say in Brazilian politics; this is worrying because what they get away with affects the rest of the world. The crux of the matter is that the world is worried because Brazil is the guardian a resource that is precious for the entire humanity. There are other countries in similar positions: Saudi Arabia controls a huge percentage of the world’s petroleum, Russia detains gas that is essential for the functioning of Europe, Britain and the US host a banking system that the world depends on, the United States detains most of the servers that enable the Internet to function, etc.. the examples could fill out this page. However when we look at this problem from a different perspective: if Brazil detains this crucial, so to speak, ecological capital, the so called “First World” detains a disproportionate amount of the world’s wealth. No one needs to be a scholar in history to know that this advantage was obtained by extracting richness from the so called “Third World”, and that this was done with the use of its also disproportionate military power. Also, no one needs to be a scholar in economics to know that if the wealthier countries administered these resources more rationally this would tackle poverty which is the main threat for forests, not only in Brazil. While we read plenty of articles questioning the ability of the Brazilian government to tackle the environmental issue, we have never heard of any Brazilian organization claiming that Americans and European are bad in managing money and suggest that they have the answer, and that they should perhaps step in for the good of human kind. When one looks into the hard facts one sees that the worst time for forest devastation in Brazil was in the seventies, when the country was under a dictatorship and no one could protest against anything. The regime was sponsored guess by who? the United States of America and their allies who did not want Brazil to follow Cuba’s steps. 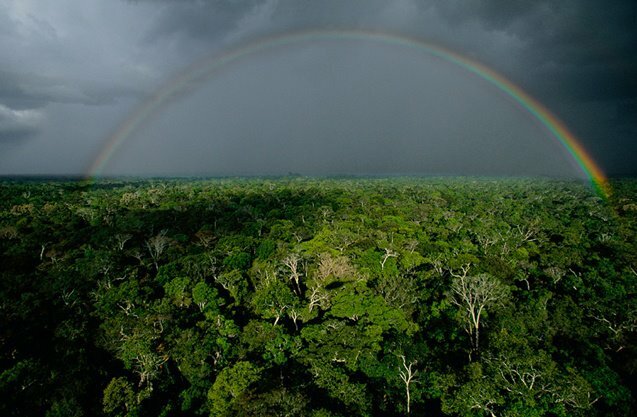 As democracy returned and established itself the rhythm of the forest devastation decreased, Brazil is now the biggest investors in the world in forest protection. Obviously a jungle with continental dimensions is difficult to control and there are problems, but not to the alarmist extent that one reads in many ecological articles about Brazil. The Amazonian forest is still bigger than Europe, there are an estimated seventy tribes who have never had contact with white people, its rivers are still unpolluted despite their being a good deal of foreign factories next them beginning to throw waste into their waters. But a point that needs to be made here is that contrary to popular knowledge the forest actually tends to expand due to the excess of Carbon dioxide in the planet’s air. Yet, some of eco-organizations suggest that Brazilians are incapable of looking after their resources and that the way to save the Amazonian forest is by “internationalizing” it. They are headed by citizens from countries that have destroyed their own forests long ago and their leader, the United States of America, has refused to sign important ecological treaties. It is our view that countries with failed eco-policies, who have built their wealth exploiting other countries resources with eco-damaging technologies and who have ultimately invented pollution have nothing to teach Brazil or any other country about protecting their forests. Help is welcome when requested, but it seems that many ecologists want more than this. They seem to have an old notion that countries bellow the equator are an extension of their own and that they have a “responsibility” towards them. Perhaps it is time for them to stop teaching and start learning. Amazing Video of untouched amazonian tribes. Amazing footage/documentary of some Brazilian tribes that have never had any close contact with our modern world. It really is amazing how there are still people in this world that have never experienced some things that we take for granted. Simple technologies like electricity, cellphones, cars, microwaves and the internet. You can almost see their jaws drop when the small plane flew over their tribe. Really hope we can stay away from them and let them live in peace.